"Whuh? It's not Friday!" I bet you're thinking but we're shuffling things around on the blog this week to join the fabulous blog tour for a very special book! So our first "Book of the Week" is popping up today, hooray!! We're just too good to you! Sometimes, books are the most welcome houseguests. They arrive just when they're most needed with an unerring sense of timing. This was the case with "Missing Jack" by Rebecca Elliott. Regular blog visitors will know how much we love Rebecca's books so we were very excited to hear that her latest title features an astonishingly awesome pair of moggies. The reason this book came along with such perfect timing (accompanied by the most wonderful hand-written letter by Hattie at Lion Hudson, who, by the way, we think is utterly amazing and worth her weight in gold - we hope Big Boss Panda is reading this!) was because of the story's core theme. Any book that can help children deal with loss or grief in such a touching, sensitive and amazing way really makes us sit up and pay attention. You see, quite recently we lost our beloved Nan - Great Nan to Charlotte, and Nan to me. She was a lady who adored animals of all shapes and sizes, particularly cats so we know she would have loved "Missing Jack" very much. I miss her dearly. Charlotte misses her too and I'm just glad that Charlotte had the chance to know such an amazing lady. On with the story. Jack is the world's greatest cat. He's not snooty like some cats, he doesn't spit or snarl, nor does he lie in a comatose heap doing nothing all day but licking his lazy paws. Jack is warm and cuddly, Jack doesn't even complain when he has his whiskers pulled by naughty babies. Jack loves curling up on Clemmie's lap (you may already know how awesome Clemmie is, from Rebecca's utterly lovely "Sometimes" and "Just Because" books - if not, seek them out RIGHT NOW buster!) Toby loves Jack very much, and thinks he's the best cat in the world. As time passes, Jack slows down, gets older - and soon he's like a cat grandpa (oh how we LOVE this section in the book where Jack is sitting in a comfy chair, flat cat-cap upon head, telling tales of his wild youth to a gathered crowd of cheeky mice). Eventually Jack dies, and Toby misses him terribly. There will never ever be another cat so amazing. Or will there? Here's where the book almost had us in floods of tears. Along comes another cat named Humphrey - and though he's not Jack either, he's not snooty, scratchy or lazy. He's daring, he's a little crazy and though he's not there to take Jack's place, he's quite happy to be loved. You don't need me to tell you how utterly beautiful Rebecca's storytelling is, nor how perfect her artwork is. She always surprises us, keeping us on her toes with a seemingly endless array of amazing art styles that she pours into her books, making it look so easy (but I bet it definitely isn't easy to come up with such luscious visuals to accompany such lovely stories). 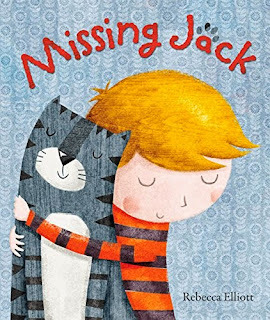 Don't miss "Missing Jack", it's the purrrr-fect way to open interesting discussions with your children about a quite tricky and sensitive subject. Charlotte's best bit: Humphrey's quite daring motorcycle stunt! Phew-ee that cat is CRAZY! Daddy's Favourite bit: With exquisite timing, along comes a book that is like a warm cuddle, like a soothing balm helping us to deal with a recent loss in a thoughtful and sensitive way. We always know we're in for a treat with Rebecca's books, but this is truly something special indeed. Like this? We think you'll love these other titles from Rebecca too!